Before you ask… I have no idea the origin of this picture. The awesomeness is off the charts! I don’t know if people still get silverware for wedding gifts, but this would be one set of silverware I could see most guys getting excited about. If you have any more pictures/info about these, let me know in the comments. My guess is they were made by some designer who wouldn’t know a charging handle from a hole in the ground and they cost $10,000 for the set. Now the set just needs some mini Shovel/Entrenching Tool spoons and maybe a mini Bayonet or Saber knife. But does one group of them really have to be the MP-40? Why couldn’t it be a Thompson sub-machine gun? Maybe the creator didn’t think the Thompson was, “evil black rifle,” enough. Funny though considering its infamous reputation during the 20’s. Take that vile brussel sprouts! Tineye couldn’t find another example of this picture in 2.0059 billion images. hmm. Careful where you’re pointing those! I don’t want a negligent discharge of peas into my mouth during thanksgiving! Great Compliment for dinner parties..
Why are there so many different kinds of forks, anyway? 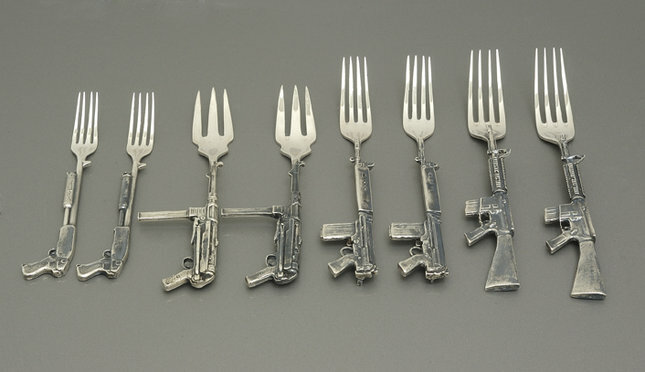 Does anyone really need more than one kind of fork? WE GOT A VEGETABLE DOWN! CALLING FOR DESERT BACKUP, NOW! And to top it all off ….. there is a matching set of plates that look like targets, cups to look like a shell, saucers to look like clay pigeons.